The IKEA Hektar Pendant Lamp collection is a trio of oversized powder-coated steel pendant lights with forms inspired by old industrial lamps. Designed by Ola Wihlborg for IKEA, the IKEA Hektar Pendant Lamp collection comes in three sizes ranging from small to large. The smallest has a width of 9” | 32 cm and height of 10.25” | 26 cm. The medium has a width of 15” | 38 cm and height of 16” | 40 cm. The largest has a width of 19” | 47 cm and height of 18.5” | 47 cm. Cord lengths vary at 5’3” | 1.6 m (small), 3’7” | 1.1 m (medium), and 44 1/8” | 1.12 m (large). What is the IKEA Hektar Pendant Lamp collection? The IKEA Hektar Pendant Lamp collection is a trio of oversized powder-coated steel pendant lights with forms inspired by old industrial lamps. 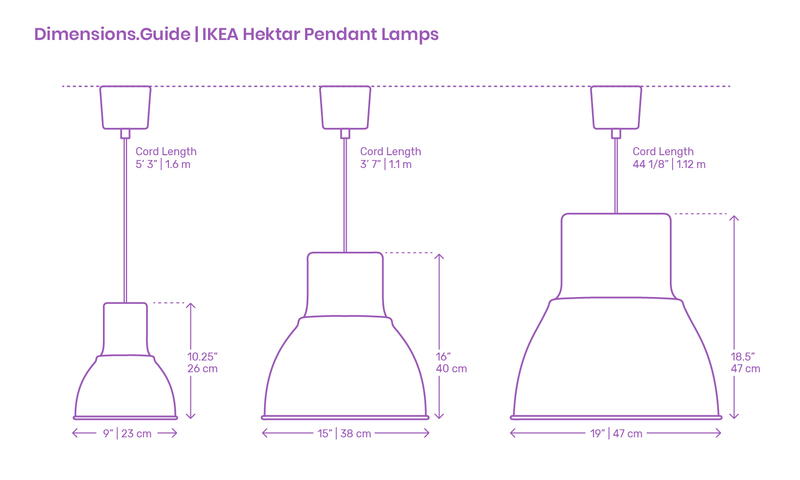 How big is an IKEA Hektar Pendant Lamp? The IKEA Hektar Pendant Lamp collection comes in three sizes. The smallest has a diameter of 9” | 32 cm and shade height of 10.25” | 26 cm. The medium has a diameter of 15” | 38 cm and height of 16” | 40 cm. The largest has a diameter of 19” | 47 cm and height of 18.5” | 47 cm. How high should IKEA Hektar Pendant Lamps be hung? Though the collection contains a variety of pendant sizes, the bottom of each IKEA Hektar Pendant Lamp should be hung 28”-36” | 71-91 cm above a countertop surface or 30”-36” | 76-91 cm above a dining table.